CheckSEND™ is a remote deposit capture product that allows you to deposit your checks directly into your Biddeford Savings account right from your office. It’s like having a branch at your place of business! CheckSEND™ is for business customers who make frequent visits to the bank to deposit checks and those that have multiple locations and need a quicker, easier way to make deposits. Your time is valuable, why spend extra time driving to the bank? Electronically scan your checks without leaving the office! CheckSEND™ is a remote deposit capture product that allows you to deposit your checks directly into your Biddeford Savings account right from your office. It’s like having a branch at your place of business! The easy-to-use scanner offers a completely secure, direct link to your Biddeford Savings Business account. Depositing checks is easy and simple with CheckSEND™. All you need is a PC, an internet connection and a Biddeford Savings Business Account! Now the distance from a branch doesn’t have to limit you. We put a virtual branch right in your place of business! Never worry about closing time again! Deposit your checks according to your schedule – 24 hours a day/7 days a week. Save travel time and money with fewer trips to the bank. Reduce operational costs. Improve deposit research and reporting capabilities. Meet earlier deadlines and improve cash flow and funds availability. Is CheckSEND™ Right for Your Business? If your business requires you to make routine check deposits, call us and ask us about CheckSEND™ today! We’ll verify your eligibility, install an easy-to-use scanner, and get you up and running - fast! Plus, enjoy 75 years of combined business banking experience from our business staff and a wide range of low cost/no cost products and services when you bank with Biddeford Savings. 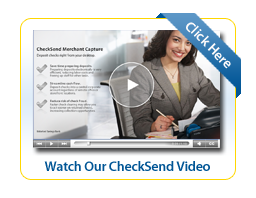 Check out the CheckSEND™ Demo link above! Then Contact the Business Banking professionals at Biddeford Savings today! Click here for online support to set up your scanner!